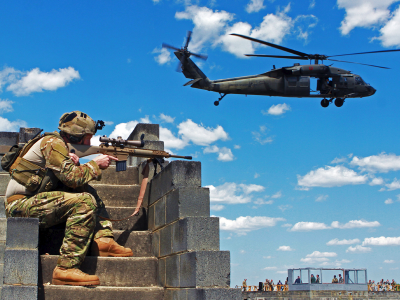 Unless the U.S. changes tact and starts a large scale attack on Syria with its own army forces the war on Syria is over. There are a few civilian lunatics in the White House who push for widening the war on Syria into an all out U.S.-Iran war. The military leadership is pushing back. It fears for its forces in Iraq and elsewhere in the larger area. But there are also elements within the U.S. military and the CIA that take a more aggressive pro-war position. Yesterday a U.S. F-18 jet shot down a Syrian air force bomber near the city of Raqqa. The U.S. Central Command ludicrously claims that this was in “self defense” of its invading forces and its Kurdish proxies (Syria Democratic Forces – SDF) within a “deconflicting zone” after the SDF was attacked in the town of Jardin. A regime warplane was targeted and dropped in the skies of the al-Resafa area […] the warplane was shot down over Al-Resafa area of which the regime forces have reached to its frontiers today, and sources suggested to the Syrian Observatory for Human Rights that warplanes of the International Coalition targeted it during its flight in close proximity to the airspace of the International Coalition’s warplanes, which caused its debris to fall over Resafa city amid an unknown fate of its pilot, the sources confirmed that the warplane did not target the Syria Democratic Forces in their controlled areas located at the contact line with regime forces’ controlled areas in the western countryside of Al-Tabaqa to the road of Al-Raqqah – Resafa. On the bottom left is the area of Palmyra on the right is Deir Ezzor, at the top is Raqqa. The dark areas are occupied by the Islamic State. A hundred thousand civilians and a small Syrian army garrison in Deir Ezzor is besieged by the Islamic State. The Syrian army is moving east from two directions to relieve the city. One thrust is from the Palmyra area along the road towards the north-east to Deir Ezzor. The distance still to go is about 130 kilometer and a major Islamic State held city, Al-Sukhnah, will have to be taken before the advance can proceed. A second thrust is from the south of Raqqa. UPDATE: The evil SDOC aka Weekend Warrior created this excellent map of what reminds him of World War II “island hopping”. The eastern Syrian desert has few inhabited places connected by roads which are of upmost important to control the huge areas in between. It shows the potential of the thrust axes and the importance of Resafa which was the focus of yesterday’s incident. Raqqa is currently besieged by the U.S. supported Kurdish forces of the SDF. 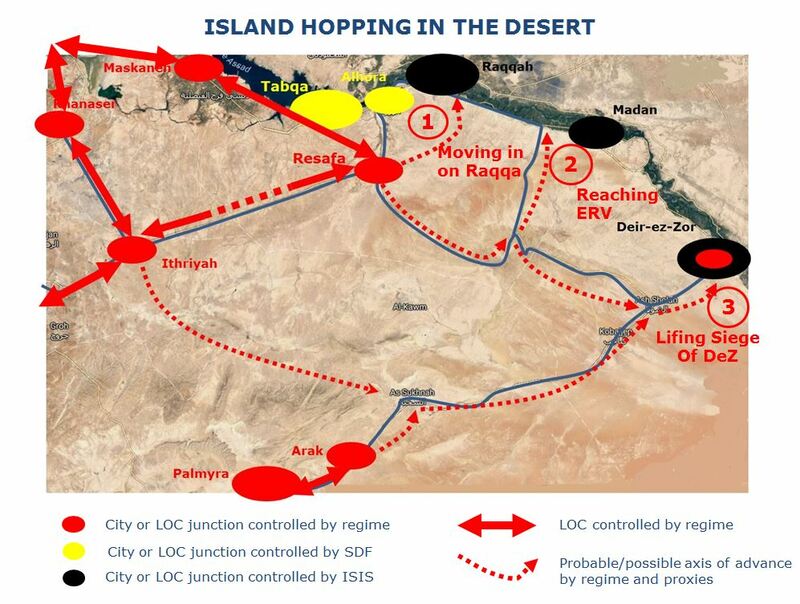 Those forces (yellow) have taken parts of the southern bank of the Euphrates around the city of Tabqa. The Syrian army is moving to the south of these forces from west towards the east. Its current target is the town of Resafa at the crossing of road 6 and road 42. 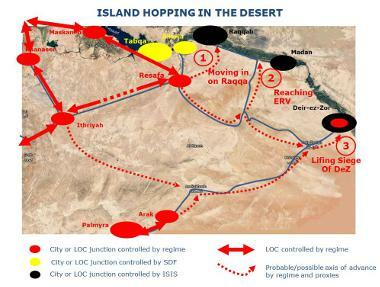 If it takes the crossing it can move south-east along the major roads towards Deir Ezzor. It will also cut off a retreat route for Islamic State forces who are fleeing south to escape the Kurdish Raqqa attack. 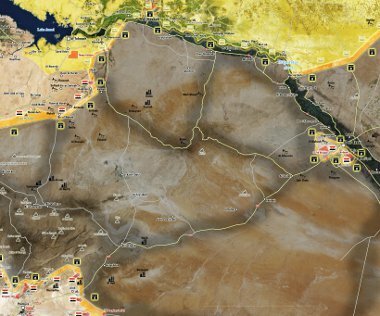 The distance to go to Deir Ezzor is about 100 kilometer and there are no major impediments along the way. Taking the crossing is immensely important for the relieve operation of the besieged eastern city. The U.S. now claims that the Syrian jet attacked Kurdish forces in Jardin. But there were none left there when the incident happened. The town was already confirmed to be in the hands of the Syrian army. The Syrian jet attacked Islamic State forces near Resafa. The Syrian army was in the process of taking the town Resafa from the Islamic State and to reach the crossroad that would allow it to proceed to the ISIS besieged Deir Ezzor. The Syrian air forces jet bombed Islamic State forces in Resafa. The U.S. shot the jet down falsely claiming that it attacked its Kurdish proxy forces. In the areas of combat missions of Russian air fleet in Syrian skies, any airborne objects, including aircraft and unmanned vehicles of the [US-led] international coalition, located to the west of the Euphrates River, will be tracked by Russian ground and air defense forces as air targets,” the Russian Ministry of Defense stated. Whatever the U.S. intent was it did not stop the Syrian army. Resafa has just now been taken (map) by the Syrian army forces. The shot down pilot, Ali Fahed, has been extracted from behind enemy lines by a team of the Syrian Tiger Force. Independent of the events near Raqqa the Iranian Revolutionary Guard launched medium range ballistic missiles from within Iran on Islamic State forces near Deir Ezzor in Syria. The distance was about 600 kilometers. The launch was billed as revenge for the June 7 terrorist attacks on the parliament in Tehran, Iran. The missiles hit their targets. As described in our last summary U.S. forces are occupying the border station of al-Tanf between Syria and Iraq in the south-east of Syria. 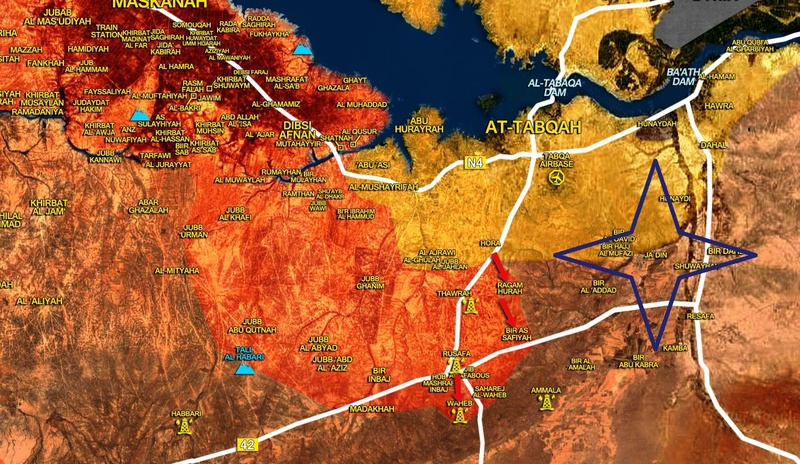 The station and the U.S. trained Arab “rebels” there were stopped from moving further north by a Syrian army push towards the border with Iraq. From the Iraqi side militia under the command of the Prime Minister joined in and al-Tanf is now isolated. 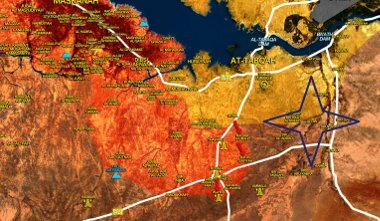 Several reports yesterday claimed that the U.S. has flown in Kurdish proxy forces from the north-east of Syria to defend al-Tanf. It obviously does not trust the Arab “rebel” forces it had trained for occupying south-east Syria. A few hundred Kurdish forces do not change the tactical situation. There is no reasonable use for those forces and the U.S. (supported) contingent will eventually have to move out and retreat towards Jordan. Israel has long supported al-Qaeda “rebels” in the south-west of Syria near and on the Golan heights. This has been known at least since 2014 and the Israeli support was even documented by UN observer forces in the area. But somehow U.S. media “forgot” to report it and the Israelis were reluctant to comment on it. That has changed. There is now a flood of reports about Israeli support and payments to “rebels” in the Golan next to the Israeli occupied parts of Syria. Few mention though that the forces Israel supports are al-Qaeda terrorists. There are also Islamic State groups in the area who “apologized” to Israel after a clash with Israeli forces. It is clear that Israel is now openly supporting the terrorists. Someone is intentionally pushing out these reports. I presume that Israel does this in preparation of the political landscape for an even large occupation of Syrian land. The reports compare the Israeli maneuvers with the Israeli occupation of south Lebanon in the 1980s and 90s. They neglect to tell the whole story. The Israeli occupation of south-Lebanon led to the growth of Hizubullah and the eventually defeat of the Israeli forces. By the year 2000 they had to retreat from the occupied land and Hizbullah is now Israels most feared enemy. It seems that Israel wants to repeat that experience.